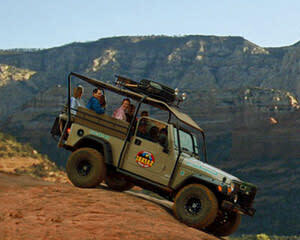 Climb through deep canyons, Indian lands and more on this Jeep ride in Sedona. The majority of your tour is on extreme 4x4 offroad trails! Everybody who visits this part of the world books a Jeep tour. Make the right choice and go with a professional guide in a comfy Jeep. You will see, touch, smell and learn all about the Southwest on this trip. Leave no stone unturned. The Jeep Wrangler being used has a custom suspension, high-top roll cage and can seat 7 passengers with ease. Comfortable bench seating with also means you can hit the trails in comfort. Your jeep tour was incredible, and my guide was awesome! I would love to book another tour with you when I return to Sedona. The price was so reasonable, and far less than your competitors. The group did a great job making sure all individuals on the trip were having a great time. The views were assume and the conversation was lively! We ended up taking a different tour and it was great! Jason was our tour guide and so well informed. Please thank him again for us and tell him we loved hiking the Fay Trail that he recommended. Travis was our guide. We had such a fantastic adventure. We've been on a competitor's jeep tour in Sedona before and this tour far exceeded our expectations! Great memories! Thanks!